Today I gladly woke early, performed far more toilette than normal, played a specially created playlist of hymns and spiritual songs, dressed my children in clothes nicer than everyday playwear, and eagerly attended a Divine Service at our home church with my husband and children. I love our Lord and His church. True confession? I have a hard time with the Holy Scriptures. Feminists would scorn me for a conservative and complementarians would degrade me for an egalitarian, I admit this freely. My honest and painful struggle, however, has been with the Bible, not its foes or advocates. There are two books of the Bible boasting women protagonists: Ruth and Esther. Growing up, the “lessons” I remember* center around the men in those books. Ruth was loyal, steadfast, etc etc—girls be like Ruth—but BOAZ. He was the image of Christ, the man to be like and to marry. Naomi, when mentioned, was a foil to another older (male) character in another book who loses everything but chooses to bless God rather than become bitter. Teaching on the book of Esther always seemed to revolve back to Mordecai—extolling his fidelity to family (raising up orphan Esther), praising his work excellence (uncovering and frustrating the plot to kill the King! ), and touting his reverence as the catalyst for Esther’s favor with the King (“for such a time as this”). I commend to you James Jordan‘s teaching on Esther. Listening to his exposition not only contradicted all I had previously learned but brought central the Being never mentioned in the text. Layers are peeled back, each character revealed as fallen and uncommendable —God alone standing worthy of praise. 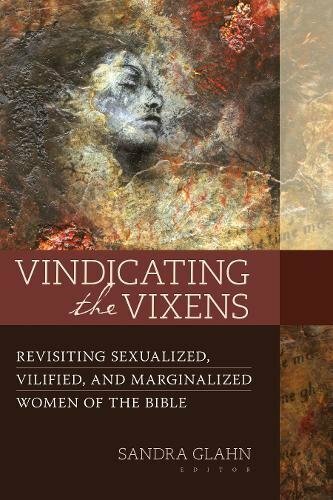 When offered an opportunity to read a chapter in the fascinating work, Vindicating the Vixens; Revisiting Sexualized, Vilified, and Marginalized Women of the Bible (edited by Sandra Glahn), my gaze went immediately to the chapter considering the Persian Queen in Esther: “Vashti: Dishonored for Having Honor” by Sharifa Stevens. The story of Esther seemingly relegates Queen Vashti to the background, an introductory character sparsely mentioned and quickly removed. Stevens opens up the possibility that Vashti’s influence pervades the narrative and is necessary for an accurate understanding of God’s preeminence. Her article is refreshing, well researched, and thought-provoking. I'll give you a glimpse of the jewels she uncovers, but for a full look you'll need to read the chapter. As Vashti and her story exist primarily “in the shadows,” Stevens elucidates the “who, what, when, where, and why” of Queen Vashti by considering historical records, the Midrash (Rabbinic teaching and traditions), and Scripture. Unwilling to abort Vashti’s story as an unimportant preview, Stevens shows how a minor character paves the path for God’s providence to reign supreme over even the Persian “king of kings, a god among men.” Salvation comes not from men, and in the end not from a woman. In the story of Esther, Stevens illustrates that women are things to be owned and paraded, imaging one’s wealth and prestige not a divine creator. My experience in learning about them as secondary characters is a truth by which they lived and died. As Stevens draws out, Vashti’s removal from power was an attempt to curtail the power of wives and keep them secondary, in the shadows. Yet, even from the shadows, God’s light penetrates the darkness to overcome it: “When the law of the land treats women as compliant sexual objects, God orchestrates a 'pretty face' to thwart the law and to deliver his people” (245). Parallels are drawn between both Vashti and Esther, and Vashti and Mordecai. Other, similar, scriptural circumstances to the one Vashti finds herself in are brought forth, shed light on her actions. The depths Stevens has plunged in Biblical and extra-Biblical texts are illuminating, delving deeply to see more clearly. The single chapter I read resonated deeply with the frustration and despair I have felt as a female student of God’s Word. It also spoke a bold truth to calm my fear that somehow that Word is not enough for me, a woman. Sisters in the faith, if you struggle likewise, this book is for you. Everyone else in the faith, if you know a female believer, this book is for you. Allow light to shine in and from those deep shadows. *Fair is fair – there ARE lessons I remember considering the impact of the women in these stories, but they were rare.